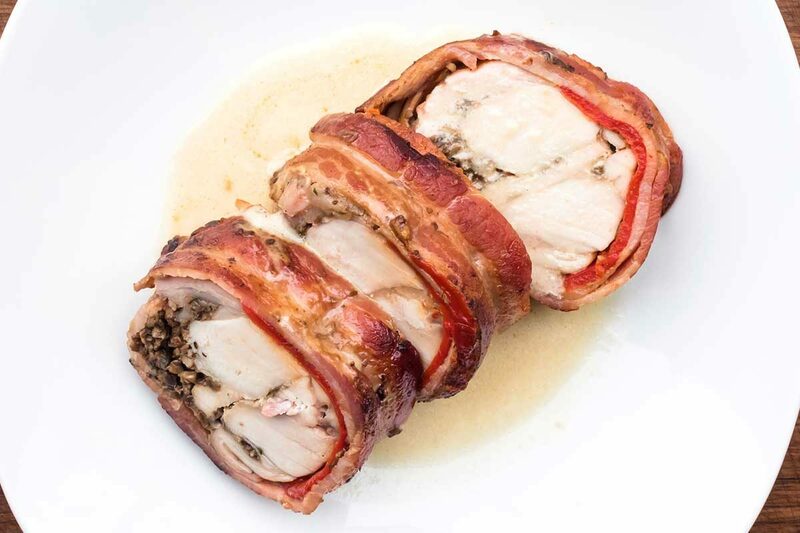 Umami-packed porcini, cremini & thyme duxelles wrapped in velvety rabbit meat & rich, smoky bacon, finished with a sherry cream sauce. This recipe has a lot of steps, but the results are beautiful & delicious – a real show-stopper! 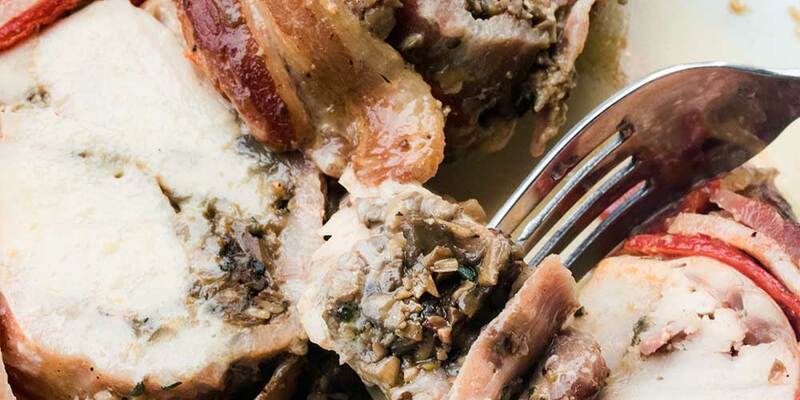 You’ll likely end up with extra mushroom duxelles. They’re delicious spread on toast as an appetizer or snack. Pour the minced shallot into a pan, oiled with the 2 tbsp of olive oil, over medium heat. Add the salt & stir. Continue to cook, stirring, until the mushroom pieces are very well caramelized. Add the thyme, lemon, pepper, sherry, and additional salt to taste (err on the side of under-salting since you’re wrapping the rabbit saddles in bacon). Remove the duxelles from the stove & let them cool completely. Lay out the bacon strips, shingled so they slightly overlap in two “mats” – six slices each. Take two additional slices for each mat, and lay them perpendicular to the other slices in the middle, with a small portion (1 ½ inches) of each of these strips in the middle, but the rest trailing off to the side of the mat. Lay the piquillo peppers in a single layer across the middle of each mat (you’ll need about 4, depending on size, for each mat). Very lightly season each saddle with salt & lay them across their respective bacon & pepper mats so they cover them completely. Whisk the egg white until it loosens up. Take half the cooled duxelles (reserve the other half for spreading on toast or use in other recipes) and mix in the egg white. Spread half of this mixture across the center portion (following where the spine used to be) of each rabbit saddle in a line. Roll the rabbit saddles around the duxelle filling, bringing the peppers & bacon around them. Use butcher’s twine to truss the bacon bundles thoroughly & tightly so they won’t come undone. Put rabbit bundles in a lightly oiled, oven-safe pan over medium-low heat. As the fat begins to render out of the bacon, gradually increase the heat so you can get a good sear, browning the surface of the bacon on all sides. Once the bacon has browned, move the pan to the oven and roast until the internal temperature of the stuffing reaches 160°F. Combine the cream, porcini soaking liquid & sherry vinegar in a small pot. Bring the mixture to a boil & simmer until it reduces in volume by 1/3rd. Remove the roasted roulades from the oven & let them rest for ten minutes before carefully removing the twine & slicing. Serve with the sauce & your choice of sides.